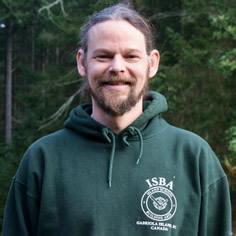 James Mitchell , Builder, Author and ISBA Big Wood Instructor for over 16 years. His book Craft of Modular Post & Beam was the first to introduce modular log building, making it doable for Owner/builder’s and eliminating the boom-and-bust cycle for the Contractor’s. His book Master’s Guide to Timber Framing is the first to introduce timber Virtual Layout and Mitred Joinery based on Centerline Referencing…Achieving perfection with an imperfect material and uniting round (log) with square (timber). James never lost focus of that passion and for over thirty years has been building, writing and teaching about Big Wood construction,; helping people achieve understanding and independence in building and owning their home,...it is the Island Way. 1974 Graduate, B. Allan Mackie School of Log Building. 1974-79 Builder, Log and Timber housing, British Columbia. 1978/9 Instructor, B. Allan Mackie School of Log Building. 1981 Graduate, Industrial Education, University British Columbia. 1983 Videos, Construction, Homeowners Assistance Program, NWT Housing Corp.
1984 Author, Short Log and Timber Building Book, Hartley & Marks Publ. 1986 Videos/Manuals, Northern Contractor Development, NWT Arctic College. 1992-95 Owner/Builder, 4500 sq. ft. P&B ISBA Residence. 1997 Author, Craft of Modular Post & Beam, Hartley and Marks Publ. 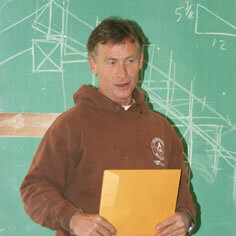 1997-… Founder/Instructor, Island School of Building Arts. 2012 Author, Master’s Guide to Timber Framing, ISBA Publ. 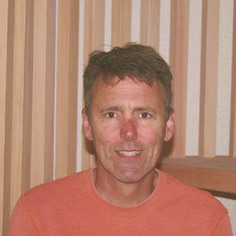 SketchUp course Instructor Peter Gron graduated from the University of Victoria in 1986 with a bachelor’s degree in Computer Science. Son of a builder, Peter grew up building all manner of things and helped finance his university years with jobs in construction. After a long career as a computer programmer and several years immersed in boatbuilding, Peter, an alumnus of ISBA’s Post & Beam and Hammer Bents courses, is now pursuing a career in designing and building timber frame structures. This is Brad's third year as the Instructional Assistant at ISBA and he brings a strong background in construction and a great work ethic to the shop and log yard. Brad is an excellent resource for our students and, as the sawyer responsible for milling the timbers for our project frames, he will be demonstrating the use of the Woodmizer mill during each course. 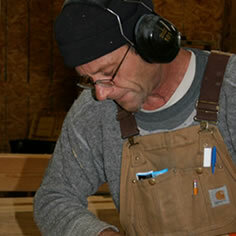 Dave apprenticed as a woodworker in the 1980's, specializing in traditional staircases, and soon realized his calling as a carpenter, working on challenging architectural homes. With 35 years of experience, Dave has built all manner of things, from concrete forming and framing to fine finishing - including the exceptional staircases at the ISBA Great Hall. He has embraced all aspects of carpentry and building. Patricia Rokosh joined ISBA in 2015 as Manager of the school and student services. Along with 15 years in post-secondary education in BC and Alberta, Pat brings a passion for student learning in all the skilled trades. 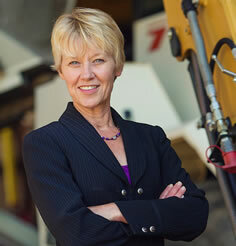 Her resume includes engineering technology, communications and marketing and, most recently, a Masters degree in Environment and Management (Royal Roads University) where her thesis focused on teaching sustainability in the Carpenter and Electrician apprenticeship trades.